Every skill has its final challenges of mastery: chefs have soufflés, athletes have triathlons, and daredevils have the Triple Loop-the-Loop While on Fire (or whatever). For fashion, there’s black tie. 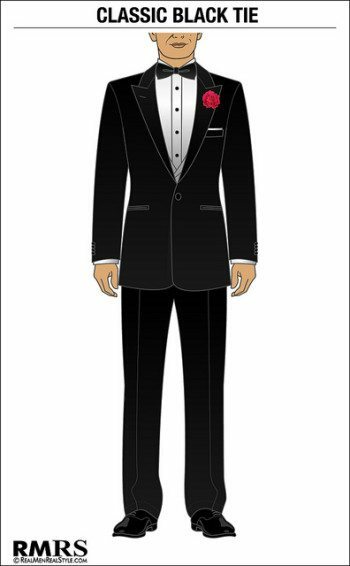 Most men view dressing for a black tie event as an awkward and unpleasant necessity, as a rite of passage reserved for high school proms and weddings, or both. This is not entirely unfair, especially the latter part. 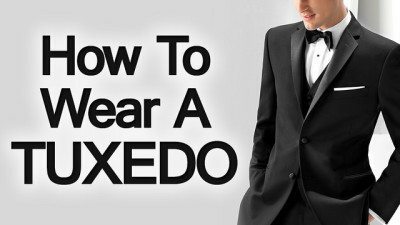 Black tie is, by definition, for special occasions — occasions so special that they their own unique uniform. That’s what makes black tie so impressive. Your best business suit may look good, but it remains something that you can wear for business. At a social event, it’s just standing in. A tuxedo is something specific to the occasion, and that makes it more impressive. Fortunately for men struggling with their first black tie event, the formal dress code is just that — it’s a code, with very specific guidelines. Anyone who sticks within the basic guidelines will look just fine. Unfortunately, most rental outlets (and a good number of for-purchase manufacturers as well) will offer garments that violate these rules shamelessly. Don’t be tempted. Stick to the timeless traditions of formal wear, and you’ll be black-and-white elegance incarnate. A dinner jacket or tuxedo jacket is not a suit coat. A single-breasted jacket is the most common and most widely-accepted style, and at its most formal it should always be unvented — that is, there should not be any slits up the back of the jacket. An unadorned “shawl” lapel, where the lapel runs in a simple ribbon from the button around the back of the neck, is the most classic black tie option. Peaked lapels, with upward-sweeping points near the collar, are appropriate and preferred by some men for the added flair, but it is worth remembering that black tie is defined by understated elegance. The simple shawl collar is usually the better choice unless a man has a serious social reason for wearing a more attention-drawing option. Notched lapels are offered by some manufacturers, but are generally considered to be inappropriate for formalwear and should be avoided. Dinner jackets are almost always black, with either satin or grosgrain on the front of the lapels. Midnight blue is equally acceptable, but like the peaked lapel will be the less-common option in a crowd, and a man should carefully consider whether or not it is appropriate to stand out to a greater degree before choosing these options. Formal wear is, by definition, matched. Trousers should always be made from the same fabric as the jacket, and the fabric on the seams should match the lapel facings. A single braid is the most traditional seam adornment, but a simple, narrow band of fabric is equally-appropriate and far more common today (the braid, however, remains a sign of high-quality formal trousers). There will be no cuffs, as they would interfere with the seam decoration. Formal trousers are meant to be worn with a waist covering (either a waistcoat or a cummerbund) and therefore are worn with suspenders. There is no such thing as a formal belt, and anyone who tells you otherwise is trying to sell you something useless. This means that the trousers will sit high on the natural waist, usually near the bellybutton and well above the hips. 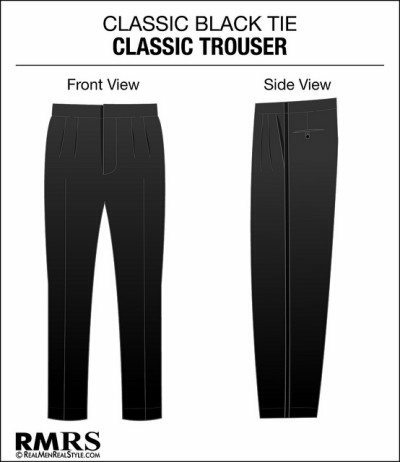 Most formal trousers will have pleated fronts, and this is by far the better-looking option. Formal waistcoats are not vests in the same style as a three-piece suit’s third piece, though they are usually called by the same name. They button low across the torso, leaving the front of the shirt largely visible. Most black-tie waistcoats have their own lapels, or else are fronted entirely with the same fabric as the jacket’s lapels. Some waistcoats will be “backless” and fasten with a buckled strap in the back rather than the buttons in the front, but vests in this style are no more or less formal than those with working buttons — it is simply a design to increase comfort and reduce the amount of fabric used. The alternative to waistcoats, cummerbunds were originally considered a more casual style and limited to summer and outdoor wear. 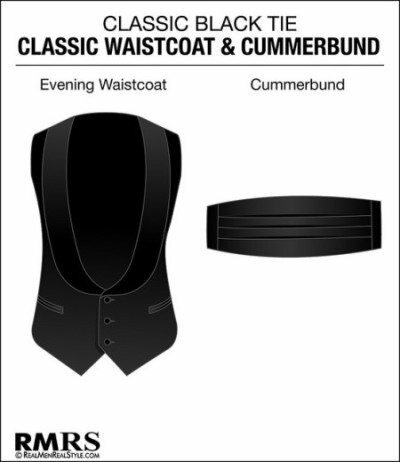 Today, a black cummerbund is considered a perfectly acceptable alternative to a waistcoat, and is probably the more common option at most stores and rental outlets. The pleats on the cummerbund face upward — think of them as tiny pockets, since that was their original function. Men used to tuck theater or train tickets into the folds, and occasionally still do. Some cummerbunds will have actual pockets hidden on the backside, but the pleats should of course still face upward. The dress shirt beneath a black tie jacket is always white; there is no room for negotiation here. 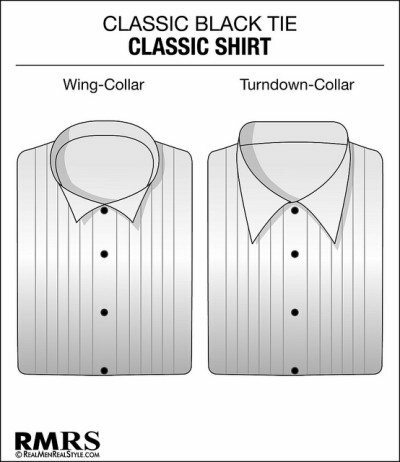 Collars should ideally be turndown, with the collar points hidden behind the bowtie, but modern black tie (particularly in America) has come to accept the sharply-pointed wing collar as well. Traditionalists consider the wing collar too ostentatious for proper black tie, but it is still widely available; men are here, as with peaked lapels, encouraged to consider carefully how much they want to draw attention specifically to their outfits. Well-made dress shirts should always have a doubled-over “bib” of fabric up the front of the garment, usually decorated with narrow, closely-spaced pleats. The shirt fastens with studs, not buttons, which should always match the cufflinks and are generally restricted to black, gold, or mother-of-pearl, with black being the most common. 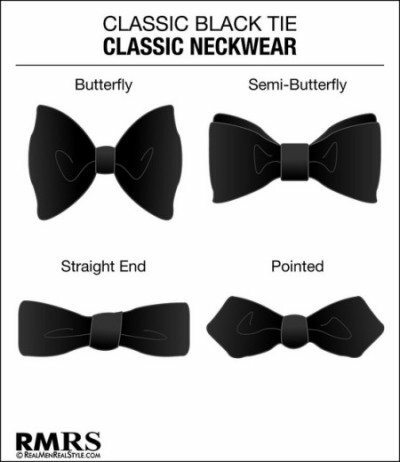 The black bow tie defines an entire style, and as such deserves a bit of respect. Pre-tied and clip-on models are simply out. A fixed-length tie of a length appropriate to your neck is always preferable to adjustable models as well; the latter will have excess fabric that doubles over and adds an unsightly bulge to the knot when tied. To keep the tie proportional to your face, try to make sure that the ends of the bow fall somewhere between the edge of your face and the outer corners of your eyes — anything smaller will make your head look oversized. The material of the tie should match the jacket’s lapel facings visually; shiny ties with soft-fronted lapels will create a glaring breach of the outfit’s uniformity. Someone who expects to wear black tie regularly will want to invest in the classic formal footwear: patent leather pumps with a black ribbon bow on the front. Modern dressers tend to accuse traditional black tie pumps of looking like either women’s shoes or slippers, but this forgets the overall purpose of black tie, which is to provide an outfit unique to the occasion — in their traditional form, men’s formal pumps are only suited to indoors wear. It speaks of luxury and sophistication, and is exclusive to the formal style. For most men, a pair of shoes strictly for black tie events is an excessive investment. 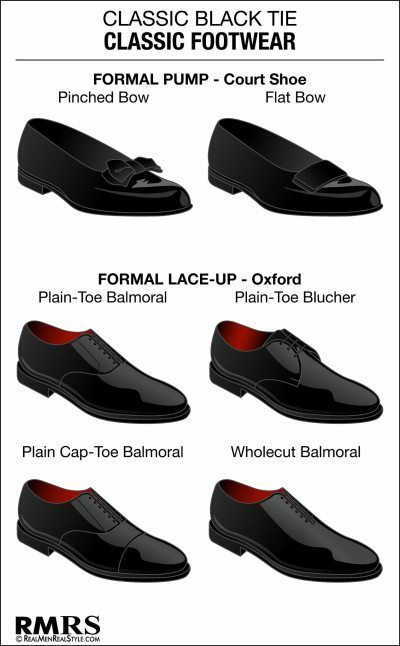 Modern black tie standards allow for any black, patent-leather dress shoe in a simple and formal style, with plain-toe oxfords being the ideal. Leaving the house without a pocket square is as unacceptable to the well-dressed man as leaving without underwear, and black tie makes no exception. A white linen handkerchief should always grace a black tie pocket, folded to your preference — some modern gentlemen have even begun simply slipping the pocket square in and letting it take its own shape, adding an eye-catching irregularity to the otherwise-uniform ensemble. More traditional folds are always acceptable, but try to avoid pre-made pocket squares with a permanent fold in them — these are easy to spot by experienced eyes, and rank alongside clip-on bow ties as a beginner’s mistake. 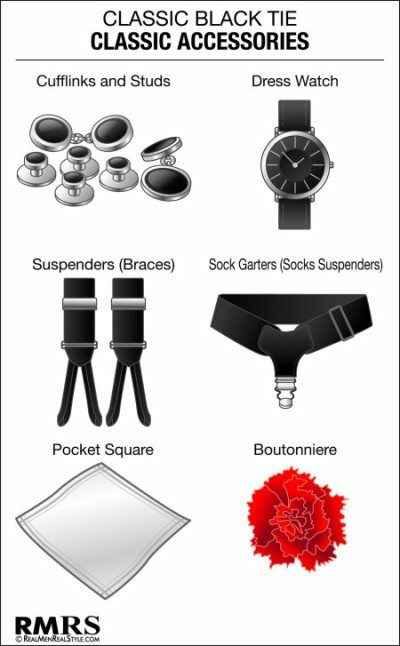 A boutonniere — small flower in the buttonhole of the left lapel — is an option of formal wear that may or may not be appropriate to exercise depending on the event. Only a few flowers are considered “true” boutonnieres, and not all florists will know the limits of traditional formal dress or be able to trim flowers so that they fit the buttonhole neatly. If you are confident in your florist and feel that the event is casual enough to allow a bit of personalized color among the guests, a small, fresh flower is a wonderful accoutrements to a black-tie event. Military events, particularly Armistice Day observances, will occasionally state that red poppies may be worn, in which case the proper etiquette is obviously to wear the flower as a gesture of remembrance. In the winter, an overcoat will be needed for the journeys to and from black tie events. The coat should always be dark, either black or midnight blue or a very dark gray, and it should not be made of an obviously-artificial material like Gore-Tex or nylon. Some men accompany their jacket with a white, tasseled scarf called an opera scarf or with suede gloves in dark gray or black. A modest black hat is also acceptable, with fedoras and homburgs being the most common choices — stocking caps are obviously unacceptable, and top hats, while elegant, are best reserved for wear with tailcoats (aka white tie). For more photos of our black tie clothing, click here.